Devi Mahatmyam describes how Mahishasura gained lordship over the devas after a great battle which lasted for 100 years. The devas headed by Brahma, then went to the abode of Shiva and Vishnu to plead for help. The Devas narrated the story of their defeat wrought by Mahishasura in detail to the lords. Having heard the plea of the Devas & the tyranny of Mahishasura, Shiva & Vishnu were greatly angered. Out of this fierce wrath, a very great light sprang forth from the bodies of Indra, Shiva & other Devatas due to anger. From this heavenly light emerged the magnificent form the MahaLakshami. The loud laughter of the Devi’s enormous form struck terror in the cosmos. This sight brought about great joy to the Devas & they presented the Devi with their choicest weapons and ornaments. Shiva presented a trident of his own to her while Vishnu brought forth a discus (chakra) out of his own discus & gave it to her. Varuna presented her a conch, Agni a spear; and Maruta gave a bow as well as two quivers full of arrows. Indra, lord of devas, brought a thunderbolt and a bell from that of his elephant Airavata, for the Devi. Yama gave a staff from his own staff of Death and Brahma, the lord of beings, gave a string of beads and a water-pot. While the earth quaked and all the mountains rocked, the Devas rejoiced and wished victory to the Devi! The Sages bowed to her in devotion. When the Asuras saw the Devi in the three worlds they were wonder struck. 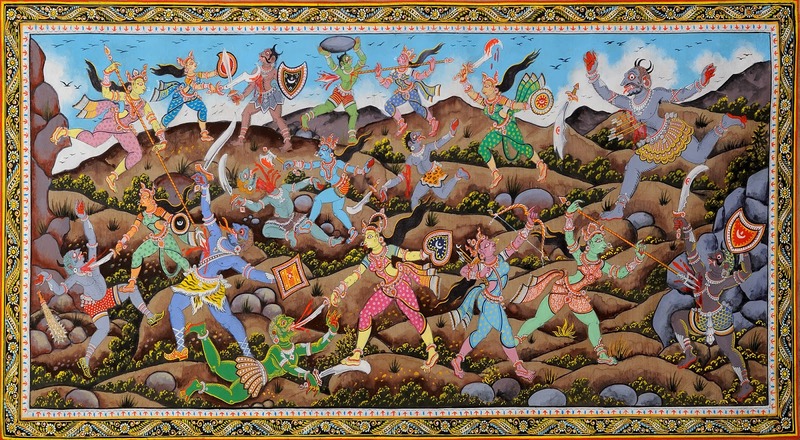 Mahishasura got agitated & sent forth his massive army to fight the Devi. 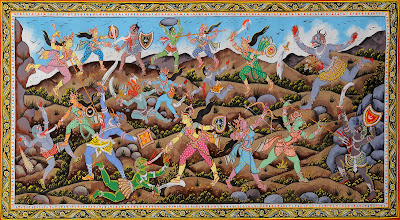 Then began a battle between that Devi and the enemies of the Devas, in which the quarters of the sky were illumined by the weapons and arms hurled diversely. The mighty generals of Mahishasura’s army battled her ferociously, but in vain. As fire consumes a huge heap of straw and wood, similarly the Devi destroyed that vast army of Asuras in no time.